These are the spectacular sights seen from Eastbourne Seafront on Monday and Tuesday October 21st and 22nd 1968. Click on the photos for a larger view. 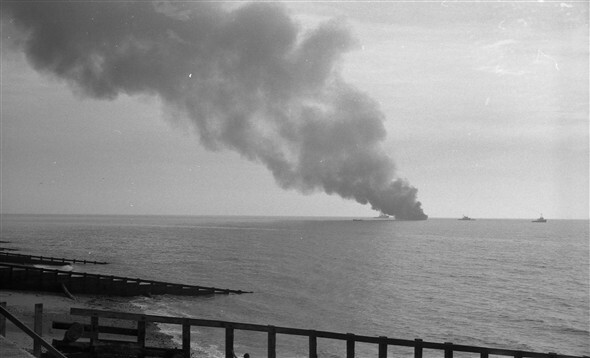 In the first photo, Meeching, seen at the right, is towing the blazing Norwegian tanker Sitakund into shallow waters to allow fire-fighting to take place. Just to the left of the plume of smoke is the famous Dutch salvage tug Zwarte Zee, out of luck this time. No salvage payout for her crew! To the right is the Thames-based tug Kenley, apparently accompanied by some small vessels, perhaps a lifeboat or one of the fishing boats hastily chartered by the press to cover the unfolding story. Heading towards shore is either Newhaven or Eastbourne lifeboat. Hidden behind the smoke will be the Dover-based tug Dominant, which helped Meeching extinguish the fires, with the help of Eastbourne fire crews. Sitakund eventually grounded further west opposite Dukes Mound, as seen in the second photo. The tug to the left looks like Meeching, but is actually her near sister Dominant. I have another view of this, and Meeching was on the port side of Sitakund damping down the remaining fire in the accomodation and engine room section of the tanker. Kenley is still on hand but Zwarte Zee had long since gone. 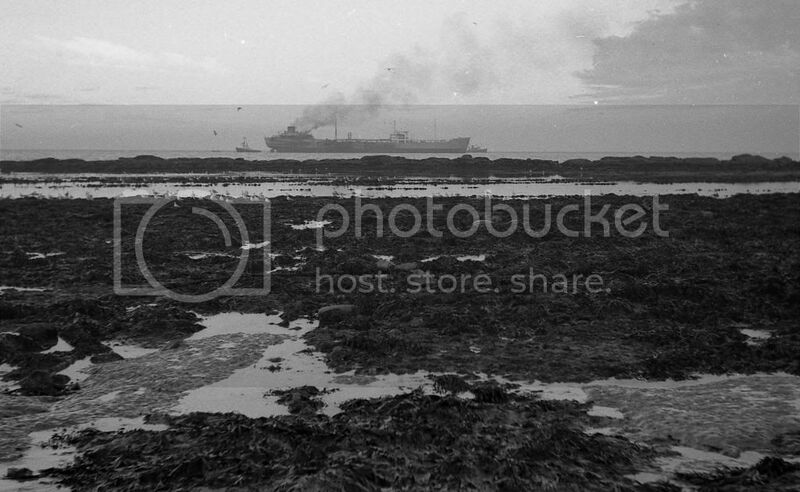 When the fires were completely put out, attempts were made to refloat Sitakund, but she was a total loss - you can see some of the massive damage to her hull - and she was eventually cut into two parts and refloated in two operations a few months later. 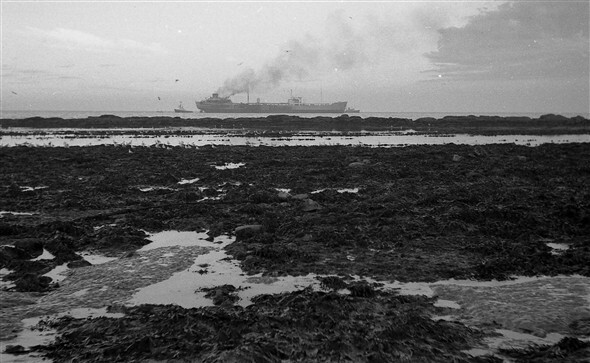 Sitakund with the fires all but out, but now aground. This page was added by Andy Gilbert on 11/06/2013.